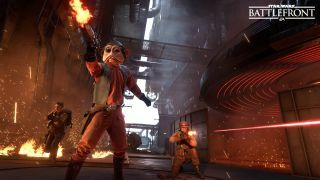 If you picked up Star Wars Battlefront but never got around to the Outer Rim DLC expansion, you'll have all weekend to try it out. The pack's new maps, modes, and heroes will be available free on all platforms from Friday, May 13 through Sunday, May 15. That means you can try out both the new Tatooine maps (Jabba's Palace and the Palace Garage) and the Sullustan battlefields (SoroSuub Refinery and Pipelines). The payload-style Extraction mode will be playable, and both Greedo and Nien Nunb will be added to the hero/villain selection. There's no time limit aside from the weekend itself, but note that you won't be able to earn Outer Rim-specific weapons and Star Cards (including from Hutt Contracts), probably because that would entail permanently unlocking them on your account. Battlefront's next expansion will head to Bespin, so EA could theoretically do a free weekend for that expansion at some point as well. It introduces the famous Lando Calrissian as a playable hero, though, so I'm pretty sure everybody will just buy the DLC straight away. It works every time.